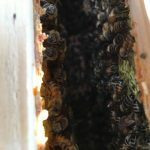 Since figuring out that the Healing Hive wasn’t going to survive I have not gone out to check on them. My thought was to leave them be and let them live out the rest of their lives in peace. At this point it has been about six weeks since I had last seen them. 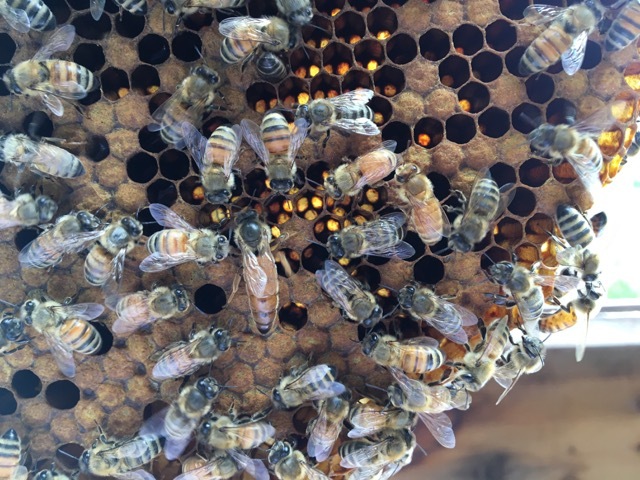 It was time to go have a look and see what was going on in the hive. 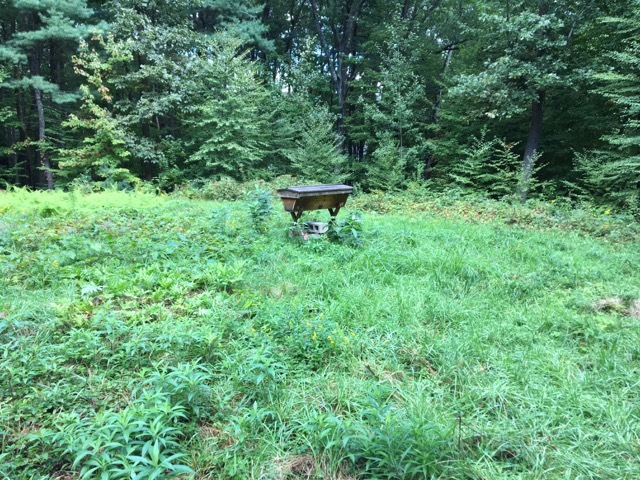 When I walked up to the hive, I didn’t see any bees flying in or out. As I got closer, I noticed that there were a couple of bees in the entrance. Looking in the observation window there were very few bees to be seen. 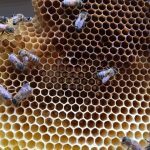 When I opened up the hive there was that sad, mournful buzz again. This was such a sad visit. There was no brood at this point and the queen was not there. 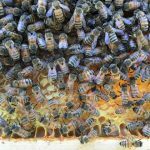 There were only a small handful of worker bees remaining and a handful of drones. It was very strange to see drones that were the size of worker bees! 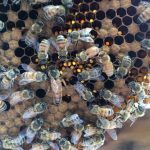 The queen was only able to lay drone eggs and she must have laid some in worker cells, because some of these drones were so small. 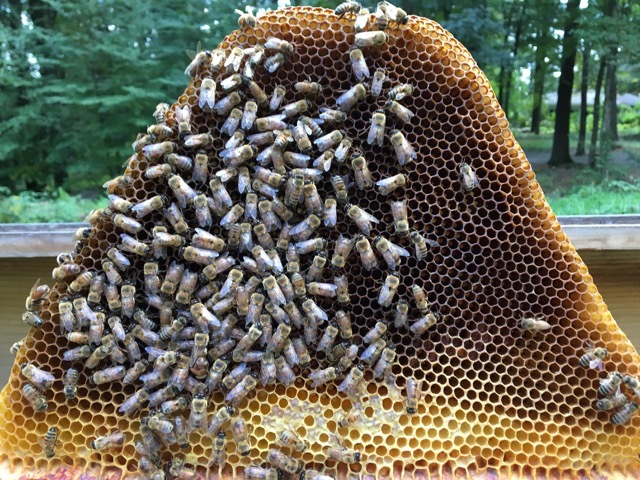 The colony has some honey and pollen, but I don’t think they are bringing anything into the hive now. They are living on whatever is left in there. 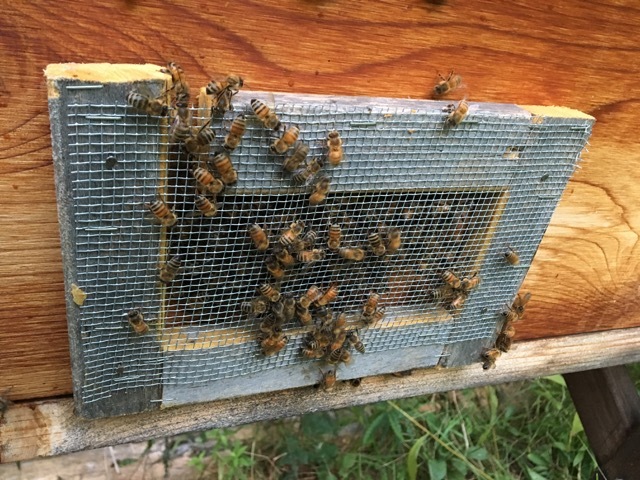 For now, I am going to just continue to leave them alone until the weather changes and I need to move the hive back home. 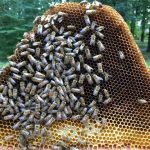 There are so few bees left that once it gets cold they don’t really have much of a chance of survival. 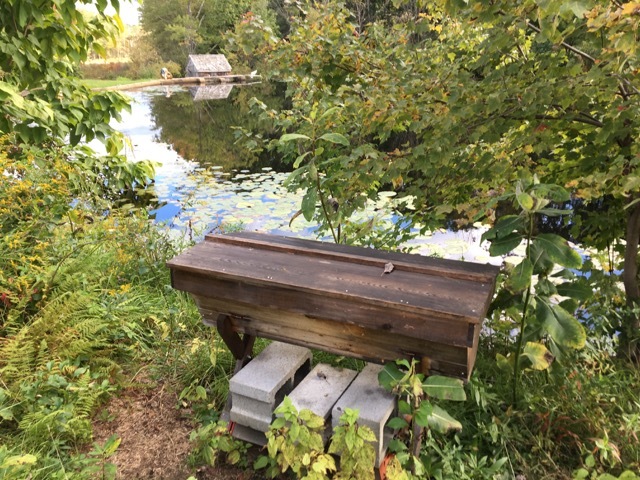 After such a sorrowful inspection it was time to go visit the hives at Old Frog Pond Farm. 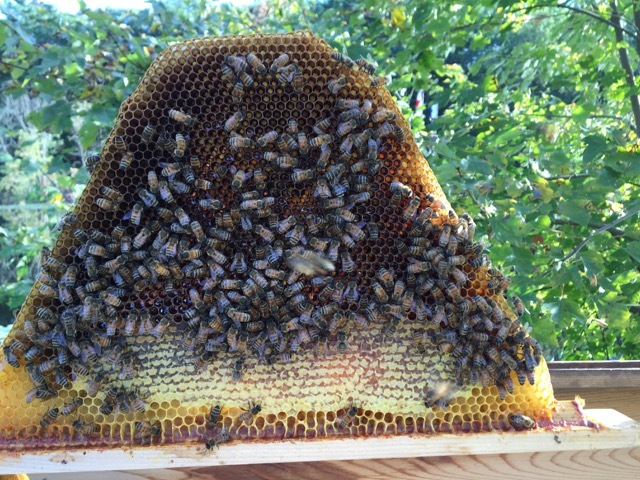 The two colonies there have consistently been a good size and seem to be healthy. 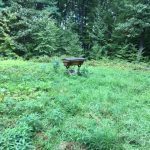 I have been feeding these hives for several weeks now and I will continue to do so until the weather no longer permits it. 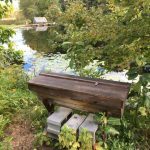 This season I have been starting at Orchard Hive quite a bit and I think I figured out that it is because the scenery at Willow Hive is so peaceful that I love to end my visit there. 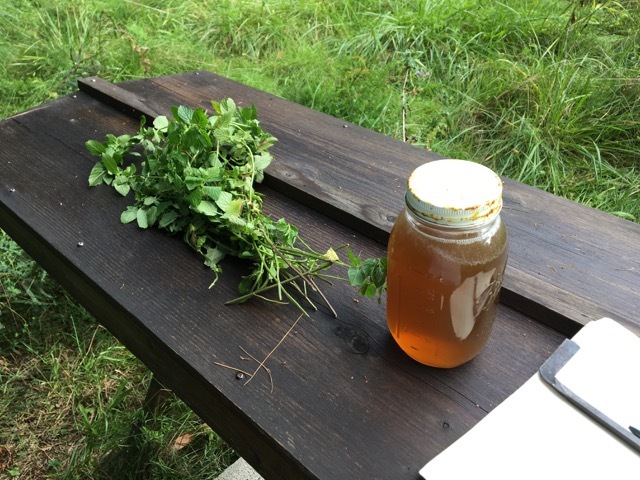 Today was no different, I started at the Orchard Hive. 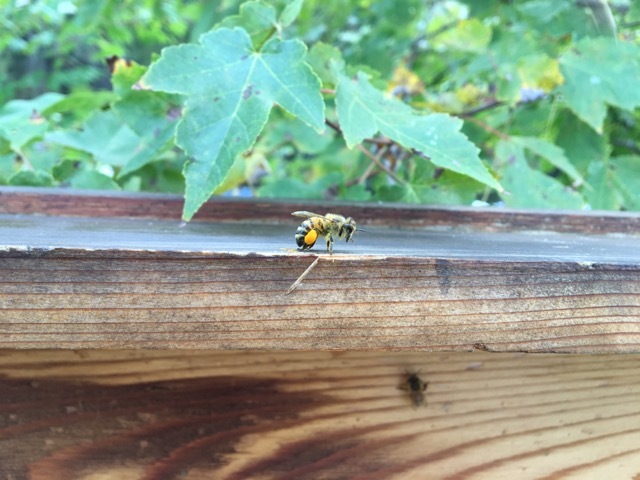 Before I open a hive, I always spend some time watching the bees at the front. Just watching them is such a good to way to learn about what things are typical and what things may be of concern. At this time of the year the biggest thing that I am watching for is robbing. 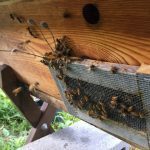 When robbing is going on the entrance of a hive is much more busy than usual and the bees flying around seem to be frantic and disorganized. 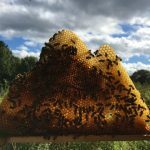 When watching a hive that is not being robbed, the bees are more calm. They know what they are doing and where they are going. Robber bees do not have that same calmness, they want to break in, steal what they can, and get out alive. 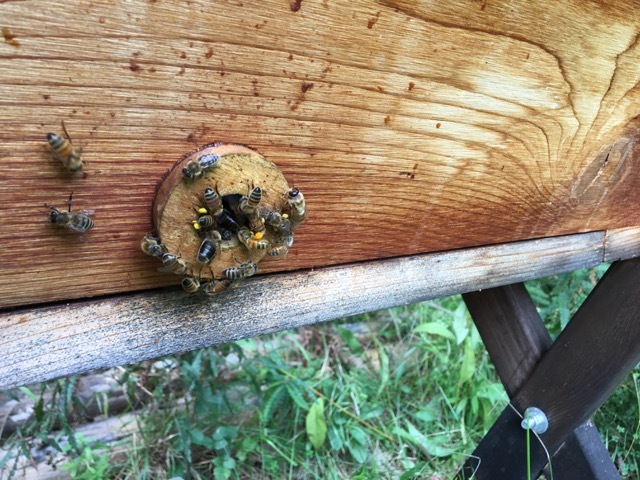 There was a little bit of robbing going on in the Orchard Hive, but the colony is strong and they were defending themselves. 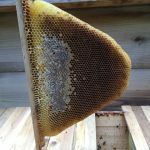 Several weeks ago, I had removed the baffle from the Orchard Hive. When I had put it on they seemed frustrated by it and congested in the entry way. After seeing some robbing today I decided to put the baffle back on. 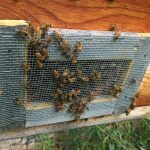 Once it is cold enough that the robbers are not out and the yellow jackets are no longer a threat, I will remove the baffles from the hives. 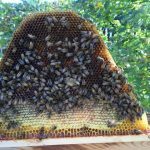 This colony is still a very good size and there is a lot of brood in the hive. 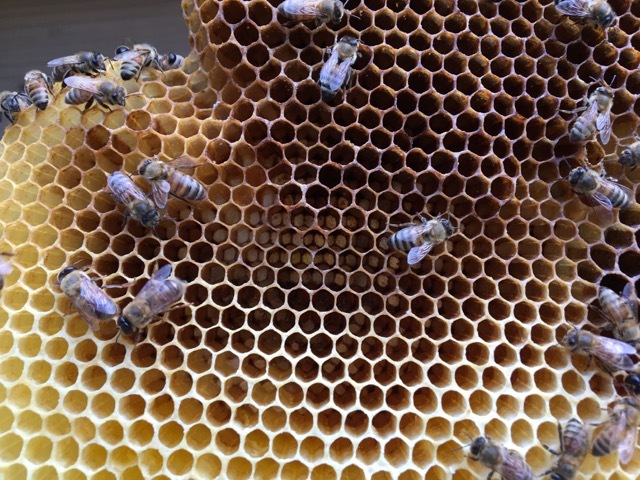 I found six bars with eggs, five with larvae, and fourteen with capped brood. 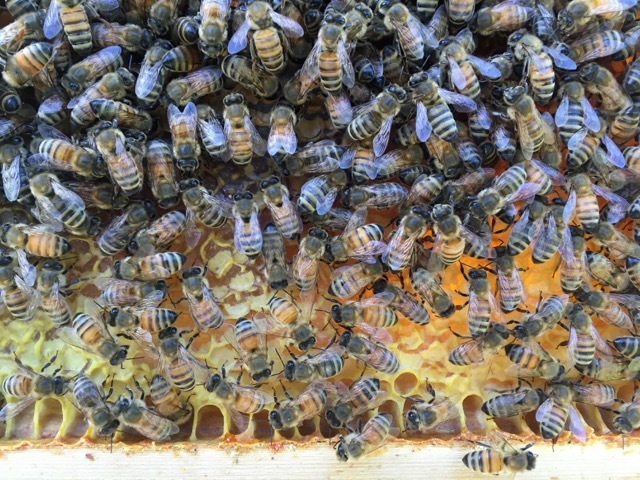 They also had a lot of pollen, but they were severely lacking in capped honey and nectar. Even with the syrup I have been giving them they are not building up their winter food stores. The queen graced me with her presence today and they all were so easy to work with. They have evicted many of the drones at this point. 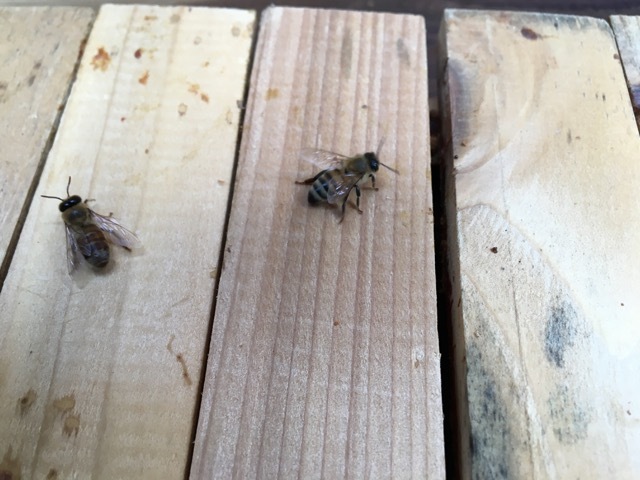 There were still some in the hive, but not many. 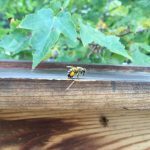 While I had the hive open worker bees were carrying drones out, so I am sure they will evict the rest of them soon. 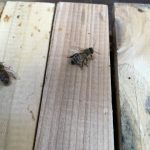 As I was closing up the hive, I made sure that everything fit back together tightly to make sure that there were no extra spaces that robbers could take advantage of. At the Willow Hive there was more robbing that at Orchard. Again, I spent some time observing and trying to figure out how the robbers were getting in. 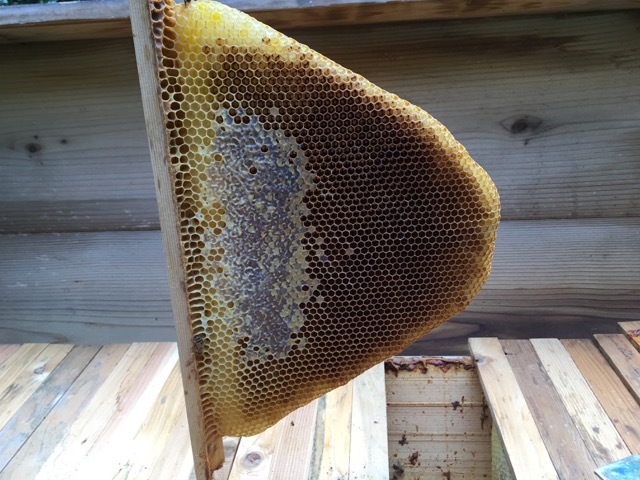 The baffle was still on this hive and I had put some small sticks in the baffle entry to make it even smaller. When I opened the lid, I saw how they were getting in and out. There was a divider board that was not sitting flush. That left a small opening on each side of the divider board. 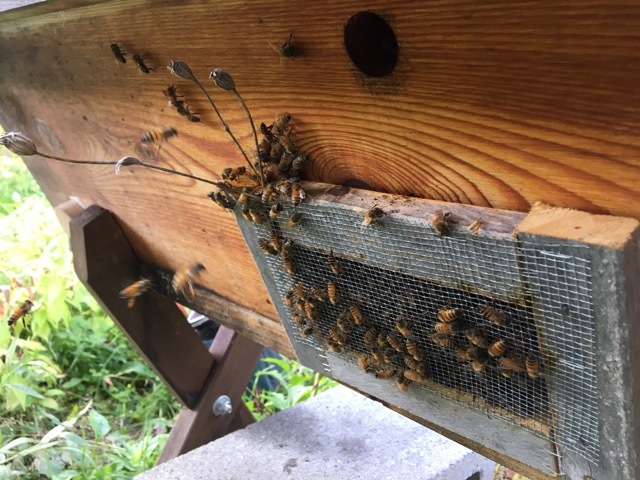 Before opening up the hive, I ran back to my car and got some paper to fold up and shove into the gaps that the divider board was creating. I folded up the paper into tight squares and shoved them into the gaps. 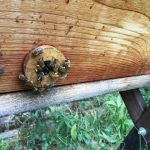 This worked immediately and no more bees were able to get in or out that way. 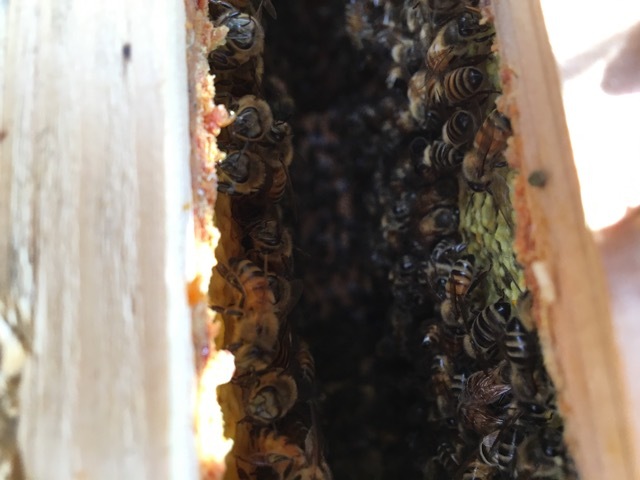 Once that was taken care of I could inspect the hive. The Willow colony is also still a good size colony. They had four bars with eggs, five with larvae, and nine with capped brood. These bees seem to be getting rid of their drones more quickly than the bees in Orchard. There were very few drones left in Willow. There was a lot of pollen and they were building up their nectar stores. It is such a relief to see them building up their food stores. 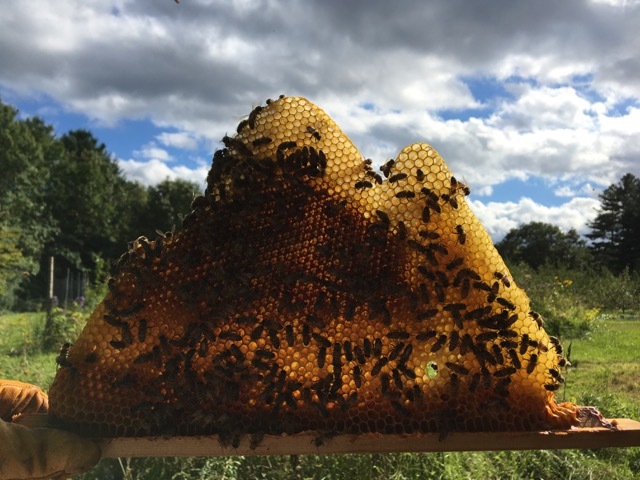 They have some capped honey too. Still not enough for winter, but it’s getting better. This colony was also very easy to work with. It is very exciting to see both of these colonies still so large at this point in the season. I will continue to feed them syrup for as long as I can to allow them to increase their food stores. I will also need to keep an eye on robbing and fix any issues that I find. 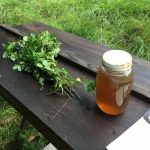 I am glad that I got to have two really nice inspections after the visit to the Healing Hive today.